My barn cat - Honey Delite. 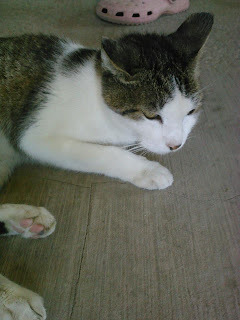 June is National Adopt a Cat Month, so I wanted to write a little bit about adopting feral cats as barn cats. A couple of months ago, my dad asked me to find him some cats for his barns because we're having a bit of a critter (voles to be exact) problem around the property. We also have rabbits. That's how we ended up with Honey Delite. I went to my local animal shelter's website and saw that they had a feral barn cat program. Turns out that many shelters offer very similar programs. Farmers and other property owners can adopt cats who are not suitable to live as a family pet to come and live in their barn. The cats, who would be otherwise euthanized, get to go live with the farmers and hunt mice and other rodents. There are many benefits of choosing to adopt a cat from your local shelter's barn cat program, if they offer one. Here are some of them. Keep rodents and other unwanted creatures out of your barn and property. 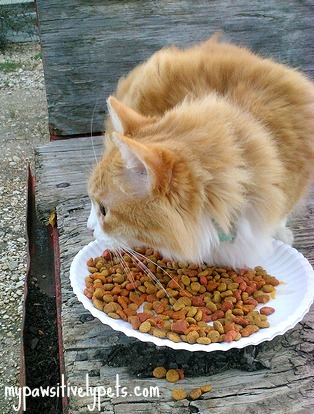 Protect any grains or other feed from rodents by employing the cats to hunt for you! The cats are already spayed/neutered and vaccinated. Most of the things I have read offer the barn cats to farmers for free. If not free, the charges are relatively low. This way, your cats won't overpopulate your property. Cats are enjoyable to watch. Whether or not you're able to pet your barn cats, they are still pleasant to watch. You'll be saving a life! The cats who are adopted out in these barn cat programs would otherwise be euthanized. They are usually considered feral or not friendly enough to adopt into new family homes. I'm sure there are other benefits, but these are some of the main ones. You will still need to offer the cats food and water on a daily basis, as well as an area that they can find shelter when needed. Veterinary care for the cats is also something to be considered. hunter - Kitty Kitty Meow Meow. If you or someone you know has a farm with a barn or some other type of property, perhaps you can check out your local animal shelter to see if they offer a similar program. Especially if you have rodents on your property. What a great program!! And so true, it is a win-win for the cats and the farmers! I hope people will consider this option during Adopt-a-Cat month! Mom and I think this is a great idea! It is very sad that so, so many feral kitties have to go over the bridge when they could be doing an important job and living a good life instead. That is such a great program, I wish we had a barn or extra space! The business that Honey Delite was hired to hunt for is a garden nursery. Our property used to belong to a horse veterinarian so there is a barn here with some other building structures too. The barn is used as a tool/shed/ checkout area now. It is a great idea. If we had a large garden and a barn we would for sure. Have a marvellous Monday. I sure wish there were more barns available for the sweeties. Need to get a barn!! A lot of farmers here have cats for the very purpose of keeping rodent population down. They are well looked after while working on the land. What a great idea! I did not even know that such programs exist. Thank you!! What a terrific program. I wish there were more barns available for kitties. I'm not really a barn girl either, we just happen to have one! Shared this post over on Twiiter - what a great idea! That's cool. I didn't know such a program existed. Quite frankly, I thought the shelter would see "living in a barn and fending for themselves" as an irresponsible practice bordering on animal abuse. Glad to see they are still open-minded so kitties who aren't people kitties can still have a wonderful life. I'm sure there are some who might still think that way. The shelters of course encourage the people to still feed their cats on a daily basis and continue providing them with medical care. So they aren't completely on their own.